Explore a variety of day-hiking trails by difficulty, distance and elevation near Vancouver, Whistler, Chilliwack and more. Use the interactive map to find trails on the North Shore, Whistler, the Fraser Valley and more regions in Southwest BC. Panoramic mountain top views, tranquil lakes, thick west coast rain forests, beautiful waterfalls, and breath taking alpine scenery are just a few of the many spectacular outdoor experiences along the hiking trails near Vancouver, British Columbia. Hiking is the perfect way to enjoy the nature and beautiful scenery that Vancouver, Whistler, and British Columbia has to offer. Vancouver Trails has a range of trails from easy to difficult, from half day to full day hikes, each divided amongst several regions and each with their own unique terrain. Start planning your outdoor adventure by viewing the list of trails or use the regional map as a reference point to where each hike is located. 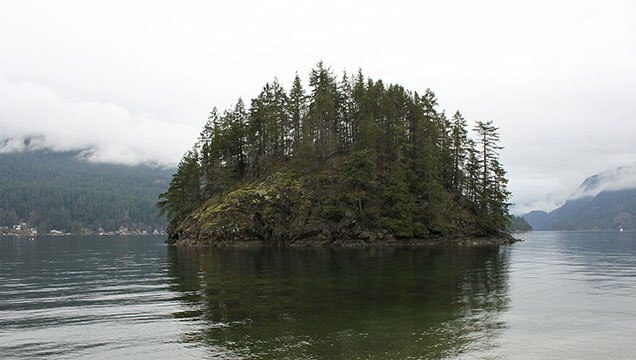 The hike to Jug Island Beach in Belcarra Regional Park passes through beautiful forests before descending downhill to a view of the tiny island.